We recently announced our partnership with a printer in New Zealand (via our IFWG Publishing Australia site) to allow us to effectively distribute our titles there. With great pleasure we can now reveal that we have arrangements in Nigeria to print and distribute Biola Olatunde‘s extensive catalogue of IFWG novels locally. Biola has a very good reputation in her homeland, particularly in the fields of poetry and script writing. For some years now she has published four novels through IFWG Publishing International, as well as a chap-ebook of short fiction. We have recognised her storytelling and social commentary skills years ago, and appreciate her narrative that resonates with Nigerian English idiom and style, but we strongly believe in supporting authors in their homelands/locale – without local printing arrangements, this is impossible. Biola’s first novel, Blood Contract, is now printed and warehoused in Nigeria and will be distributed to local bookstores. We are over the moon with this very important step forward. Her contemporary African fantasy trilogy, Numen Eye, will be printed in coming weeks. Following this, her chapbook, Sunset Tales, will also be available locally in print form. We have been waiting quite a while, and now we are proud to announce the release of the last of the Numen Yeye series, Numen!, by Biola Olatunde. The first book, Numen Yeye, was published in 2013, and the second book, Rose of Numen, in 2015. Now the series is complete and we cannot be happier. Biola is one of our first batch of authors when we started as a much smaller concern, and we were particularly chuffed to be able to publish an African author. Her first book, Blood Contract, while not part of our speculative fiction range, is a powerful novel that delves deeply into Nigerian culture, warts and all. Her Numen Yeye trilogy does the same, but this time it is intertwined with the spiritualism and religion of ancient Nigeria, and is best labelled as contemporary African fantasy. Inward analysis is what Biola is best at, and we are excited to be her publisher. Ife is now married, and in the material world her status is elevated by Babatunde, her husband, now Kabiyesi, the Lion of his people. Ife’s life and spiritual journey is still in a state of flux and uncertain. More than ever before she witnesses the corruption and vice of society, particularly among those who are supposed to represent the people. This complicates matters further. She is fully reconciled with being the incarnation of Numen, the ancient spirit entity, but Ife/Numen now needs to find purpose in this Nigerian landscape. Enter the last chapter in this spiritual fantasy, interlaced with Biola Olatunde’s unique idiom tied so closely to her beloved homeland. Numen! is a fitting end story to the trilogy and shows love and bonding, and most importantly, reveals much of Nigeria’s internal challenges – with a ray of hope. Numen! will soon be available for purchase through all good online print stores, and in ebook format in about a week. You can purchase it now through our store. For those US readers who haven’t read the first two titles, we have a very special discount offer to purchase all three by clicking here. Thanks to Elizabeth Lang for a worthy cover design, in style with the whole trilogy. Congratulations to Biola Olatunde for the completion of her magnificent trilogy. We are happy to announce that Kindle book buyers will now see Biola Olatunde‘s Numen Yeye series bundle on Amazon sites at a special price for the first two books. IFWG Publishing Australia will release the third, much-anticipated last instalment very early in 2017. Biola is our precious African author, based in Nigeria, and her Numen Yeye novels are a wonderful mix of contemporary African fiction, interlaced with deep tradition and mythology – her own brand of fantasy. Biola doesn’t hold back, providing insightful criticism of Western influence as well as the underbelly of superstition in her culture. The books are written in the idiom of Nigerian English, with a mild translation for Western English consumption. Numen Yeye is about two worlds, inextricably interconnected. Numen Yeye is a princess in the Kingdom of Light, and her spirit is channeled through a young girl called Ife, who lives in a Nigerian village. Ife’s awareness of her Light connection grows, but not as quickly as her dismay with the abuse of Nigeria’s religious heritage in dark practices. And yet she recognizes what relevance her heritage has to her peoples’, and her own, personal lives. Numen Yeye is a story about Ife’s discovery of her meaning in life, and despite her growing, special abilities, it resonates with each and every reader. It is universal in theme. Numen Yeye is also about the spiritual lives of the Nigerian peoples, including their village customs and rites. It is a revelation. Ife is no longer a young girl, but a woman living in the city, practicing medicine. She still carries within her, however, the spirit of Numen Yeye, a princess from the Kingdom of Light. While Ife’s life is professionally fulfilling, she is suffering from her transitional state – her ties back to her village and her family, the reconciliation between her spiritual and earthly forms, and her very special connection with Babatunde, her soul-mate. Rose of Numen continues Ife’s journey through the ancient rhythms of traditional Nigerian culture, and the impact of the modern world. Enter this spiritual fantasy, interlaced with Biola Olatunde’s unique idiom tied so closely to her homeland. Every once in a while IFWG Publishing chooses to publish in ebook format only, a short work by one of its authors. It may be set in the world created in larger work, or it might simply be stand alone. We support our authors and enjoy these ‘mini breaks’. 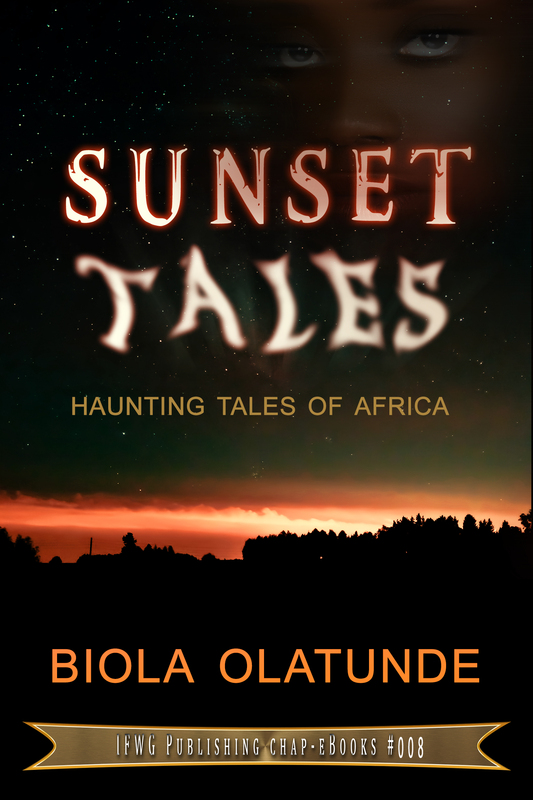 Today we have released Biola Olatunde’s collection of six short stories, Sunset Tales. We always enjoy publishing her work, which is invariably deeply immersed in West African culture and traditions.